Paul Brourman found what he was looking for on a hillside in Barcelona. Who knew the X factor would lead Paul Brourman and his Sponge/Chicago ad agency staff all the way to Barcelona, Spain? But that is precisely where Sponge founder and Chief Creative Officer Brourman discovered an eye-catching house in the shape of an X perched on the side of a hill overlooking the city and the Mediterranean Sea. 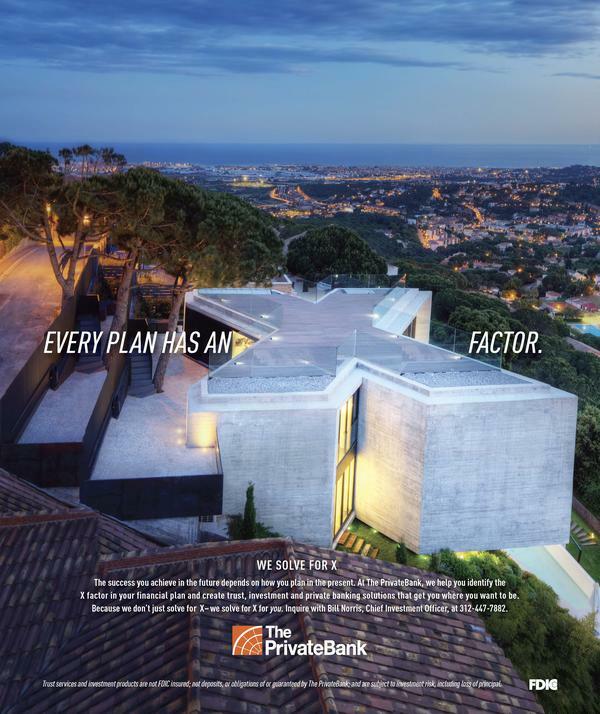 As soon as he saw a photo of the house on the Internet, Brourman knew it was the right image to go with a new print ad to promote client PrivateBank’s private wealth banking unit. The finished ad would be part of a new multifaceted ad campaign with the tagline “We Solve For X” for Chicago-based The PrivateBank. First, after getting clearance to proceed from bank executives, Brourman had to figure out how to get his own image of that X-shaped house for the new ad. He started making calls to Barcelona and soon had a location scout/producer and a photographer lined up to handle the project. The scout quickly negotiated a deal with the home’s owner to take the photo. Shortly thereafter, the photographer found himself precariously perched high atop a cherry picker device ready to shoot a series of images of the home while Brourman and his associates at Sponge help orchestrate the photo shoot from Chicago via Skype. Worried that the photographer might be in peril perched on the crane on a Spanish hillside, Brourman remembers he repeatedly urged the photographer to stay safe as he snapped image after image. With a number of shots to select from, Brourman went with a nighttime image of the X-shaped home that dramatically emphasizes the structure’s distinctive shape. Mission accomplished, now Brourman has to think about what he can do for a follow-up ad next year. It won’t be easy. “We set the bar pretty high with this one,” said Brourman.